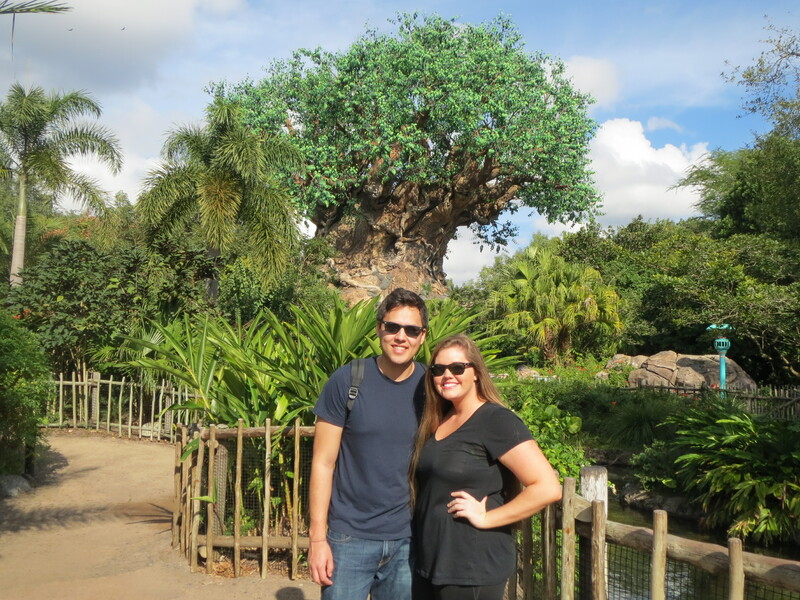 Our first morning at Disney started bright and early when we headed to Animal Kingdom for rope drop. 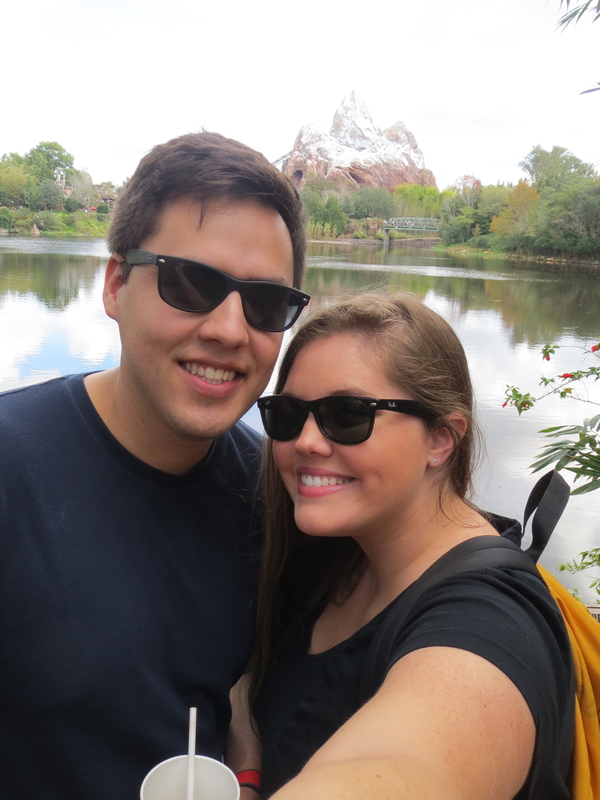 We rushed straight to Expedition Everest and rode it multiple times before there was any line! 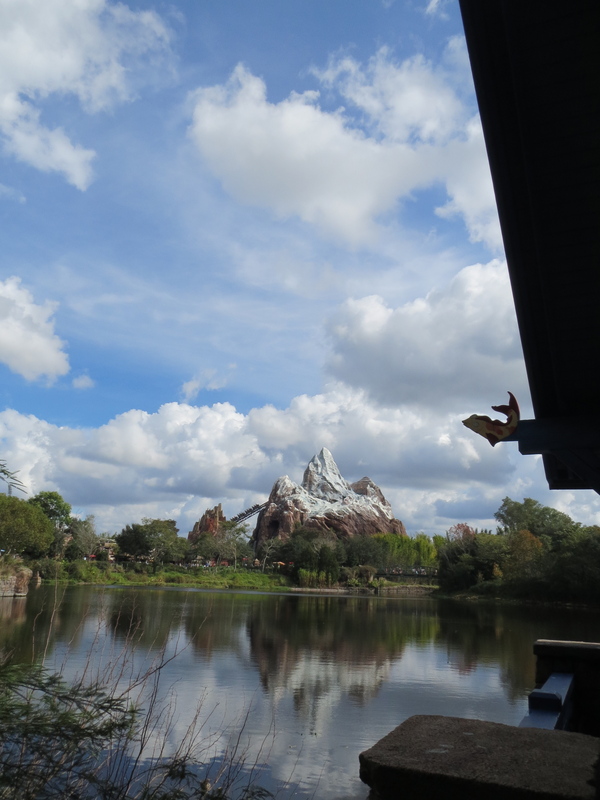 After we got our Everest fill, we headed over to Dinosaur and went on a prehistoric adventure back in tiiiiiiime. 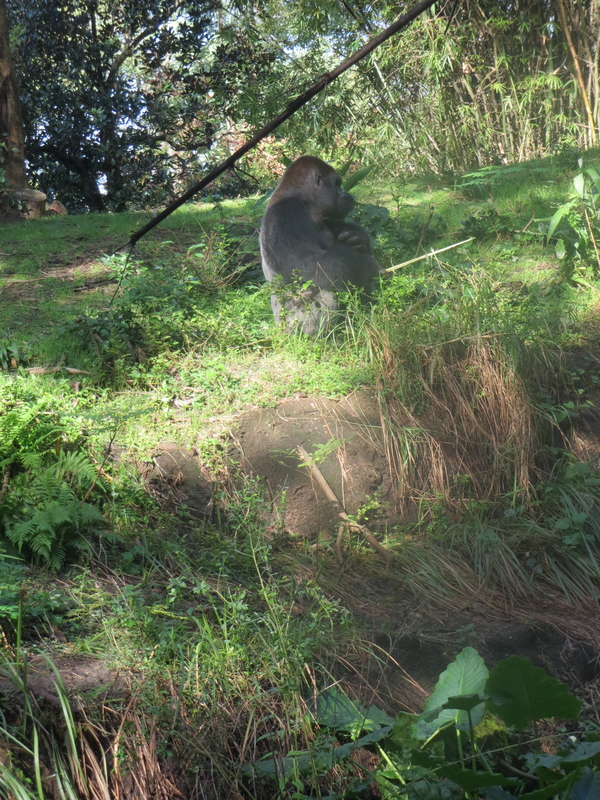 Eventually we made our way over to the Africa section of the park and enjoyed Kilimanjaro Safari. 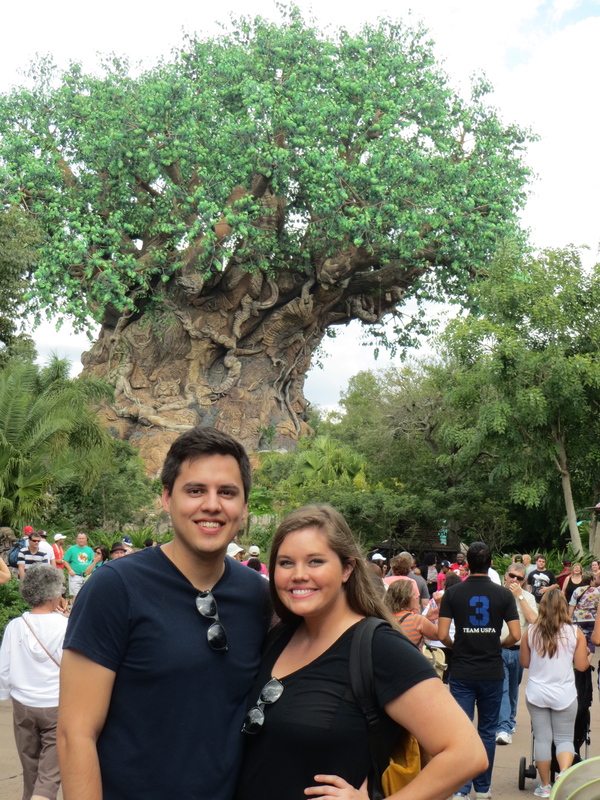 Already in picture taking mode, we snapped a few (of SEVERAL) shots in front of the Tree of Life. 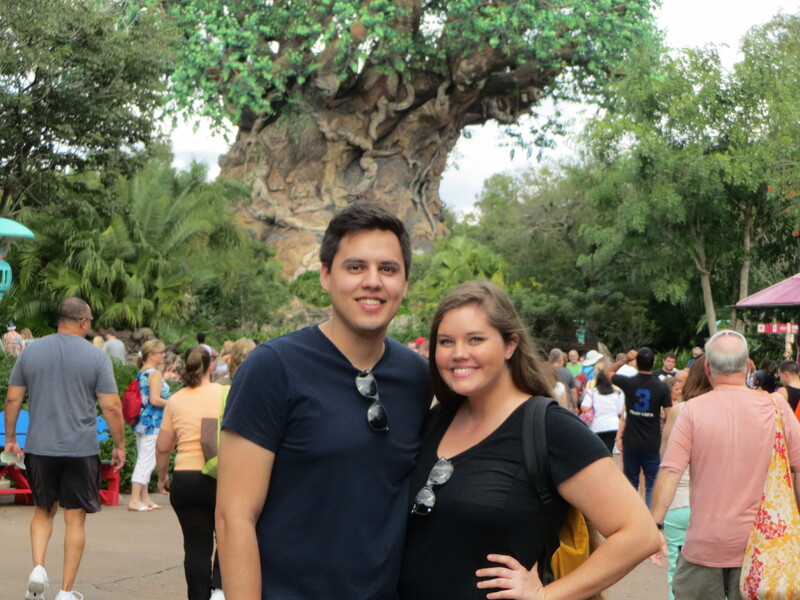 After some Expedition Everest selfies we posed for a few more Tree of Life pictures sans Ray Bans.. 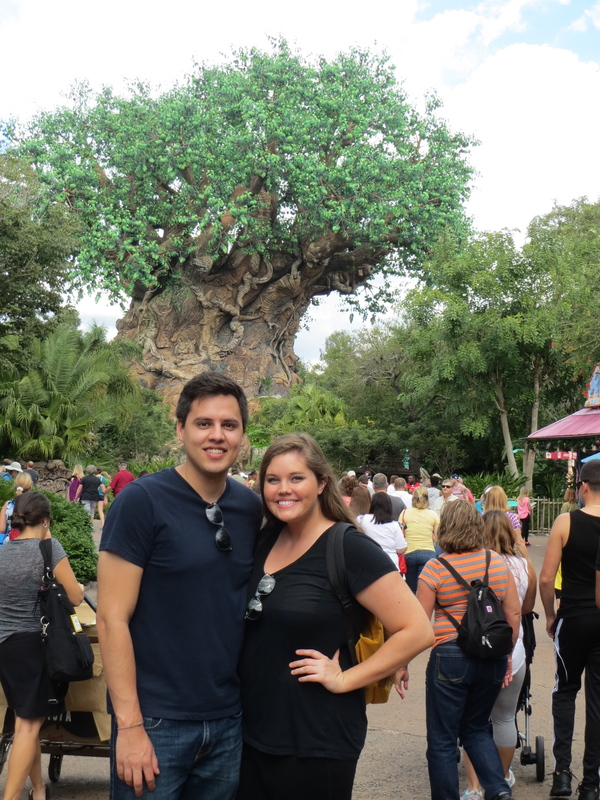 If you remember from my last post, each park has its own themed 65-foot tree. 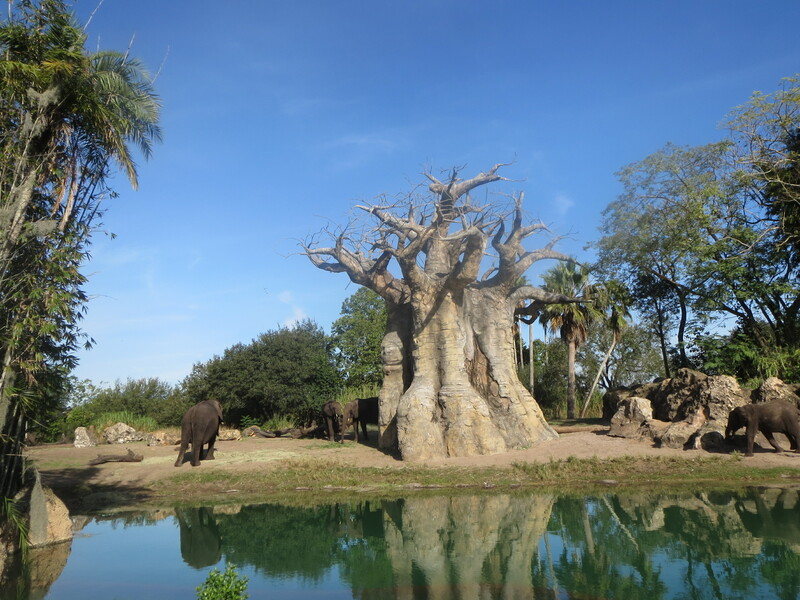 Animal Kingdom’s had (SHOCKER) animal ornaments all over it. I snapped the shot below on our way out of the park for the day. 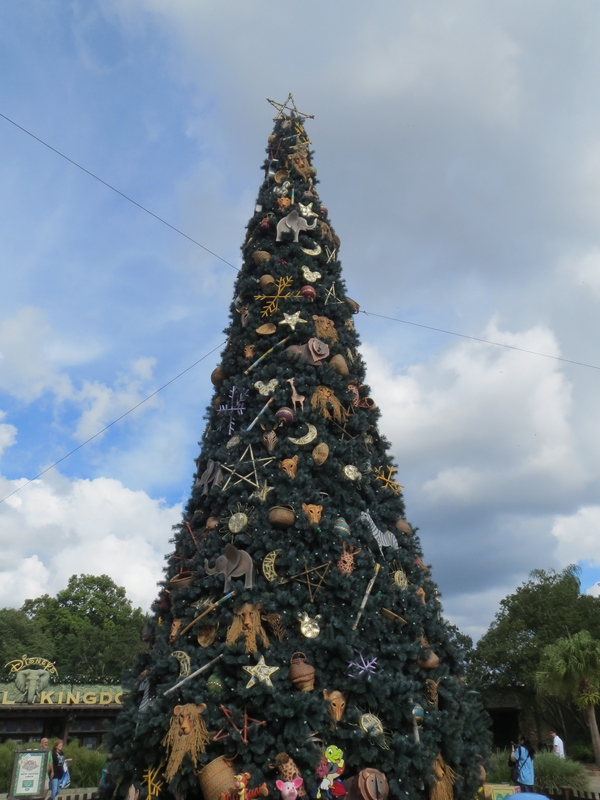 We left Animal Kingdom and arrived at Hollywood Studios, where I got a picture of their Christmas tree. 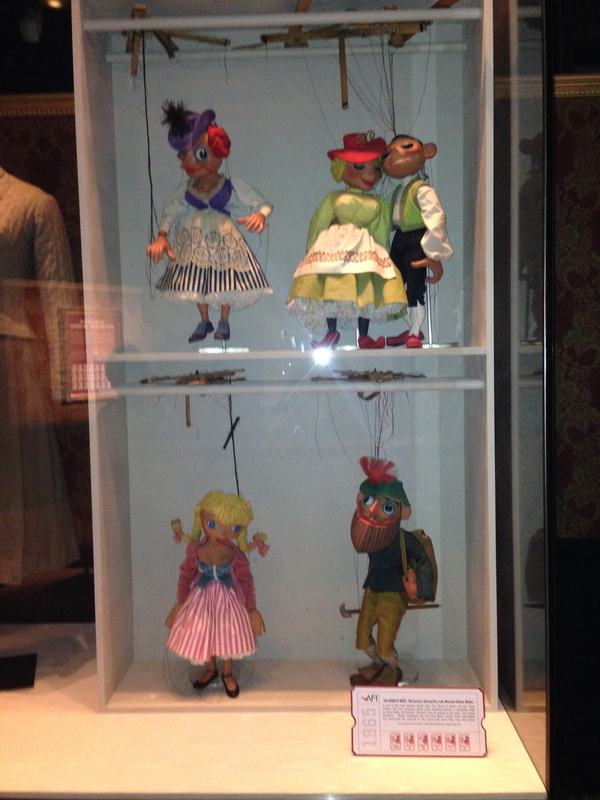 Theirs has traditional holiday ornaments but a distinct film reel base. 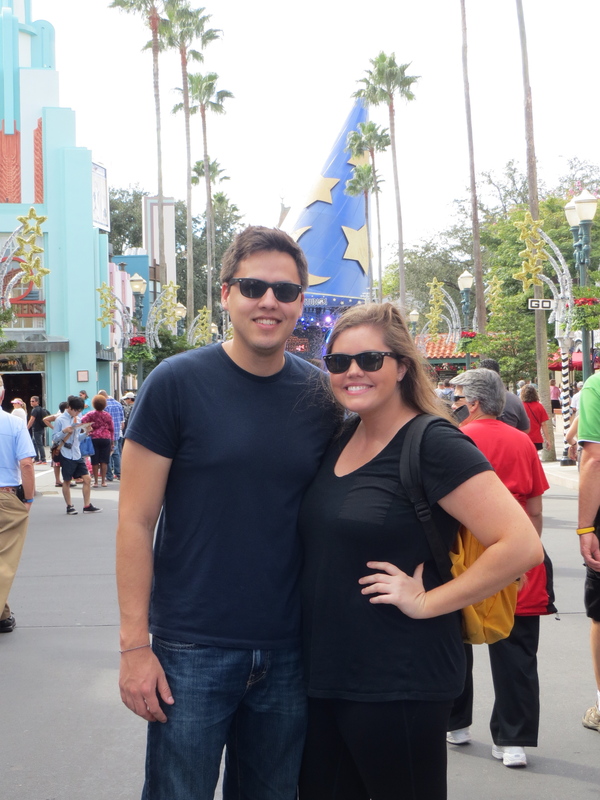 We were excited to arrive because Hollywood Studios is one of our favorite Disney parks! 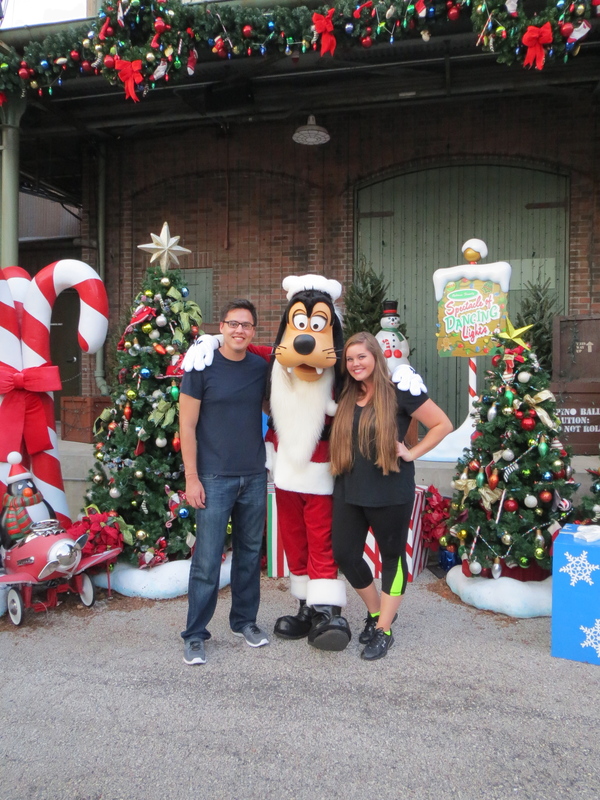 It has several of our favorite rides that we were ready to enjoy! 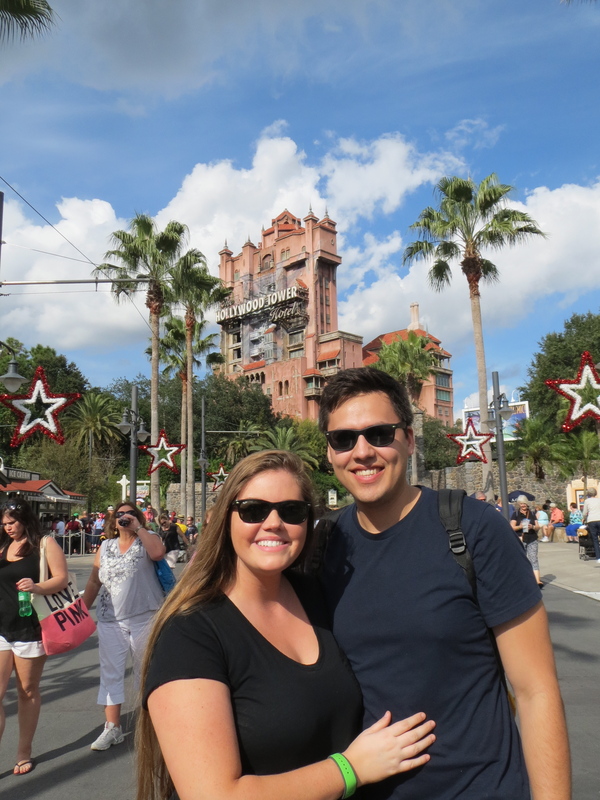 We hit up Tower of Terror and Rockin’ Rollercoaster right away because those are two of our favorite (and some of the only) thill rides at Disney World! 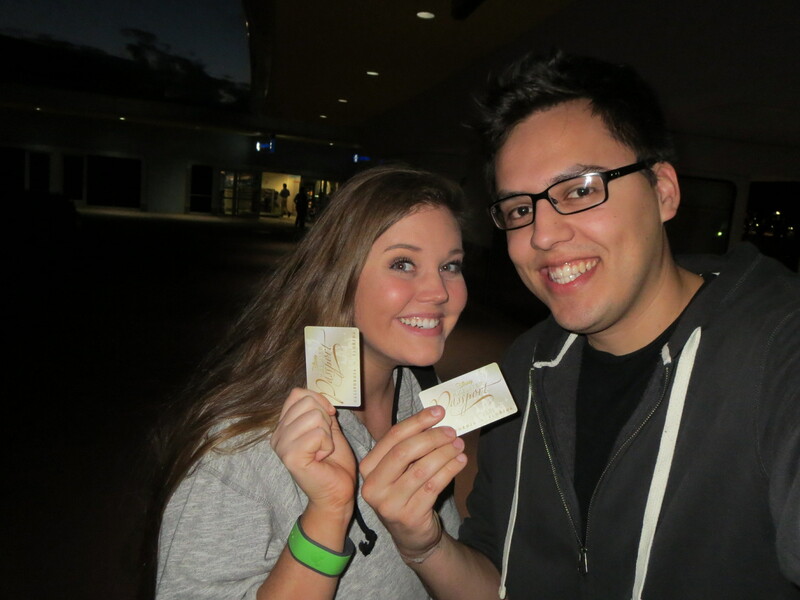 Also, we had used our Magic Bands to book some Fastpass+ passes for some attractions, so we were excited to use those. 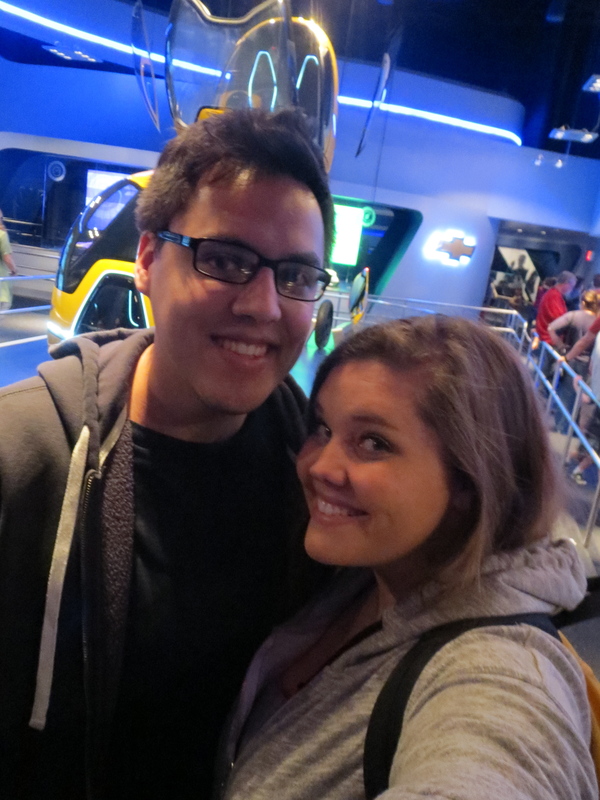 We made sure to ride one of my favorite classics, The Great Movie Ride. 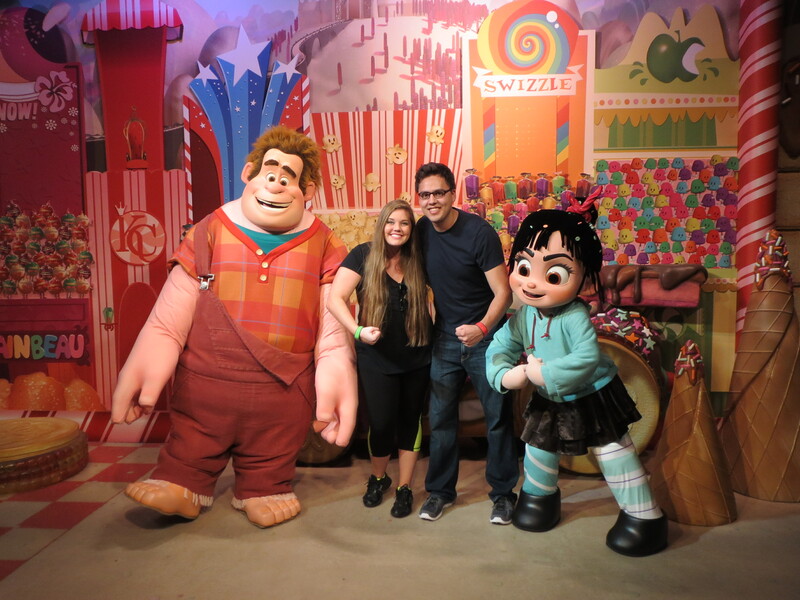 I know it’s a little outdated, but I still love “being in the movies!” The Animation Academy is nearby, so we walked over there to get a picture with Wreck it Ralph and Vanellope Von Schweetz. Right before we took this picture, Ralph stepped on my foot, and was trying to apologize (which is difficult given the fact that he can’t talk or move his fingers). I told him it was okay since it’s his job to wreck everything, and he seemed to not feel as guilty. We were able to use our Fastpass+ passes to bypass the 2-3 hour wait for Toy Story and get on Louis’s favorite ride. My score wasn’t too great, but Louis’s was super high as always! 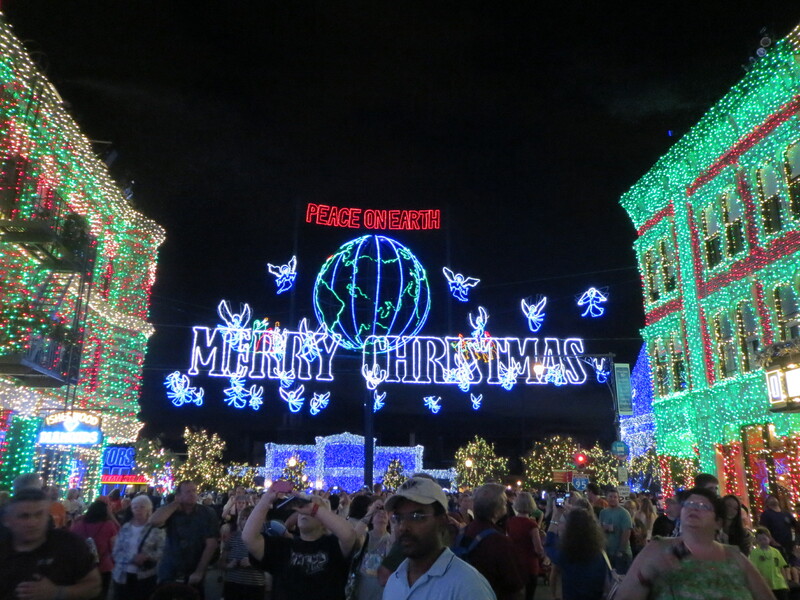 Once it finally got dark, we worked our way over to The Osbourne Family Spectacle of Dancing Lights! No, not THAT Osbourne family. 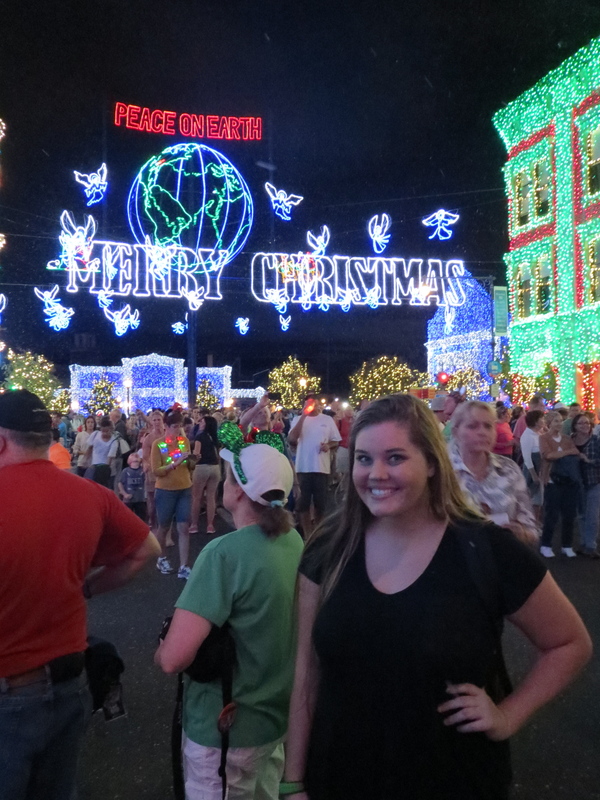 The father of THIS Osbourne family doesn’t need subtitles when he talks set up a Christmas light display for his daughter several years ago at their home, and it just kept growing. Eventually it go so large that families were trying to sue them for the congestion on their street and the (obviously) bright lights. 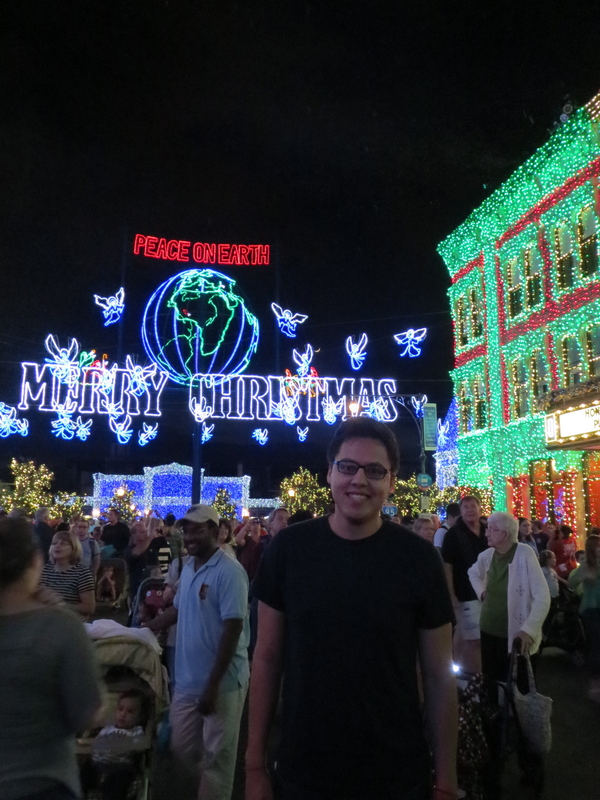 Finally, Disney stepped in and the entire display was moved to Hollywood Studios and has grown even more over the years! 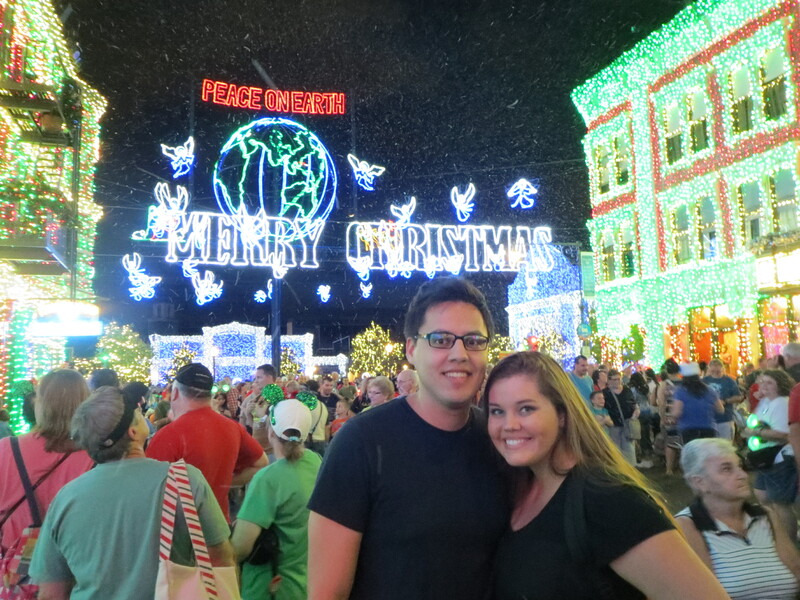 There are millions of lights that are synced up to Christmas songs, and it miraculously “snows” in Florida! It’s definitely a beautiful sight to see! 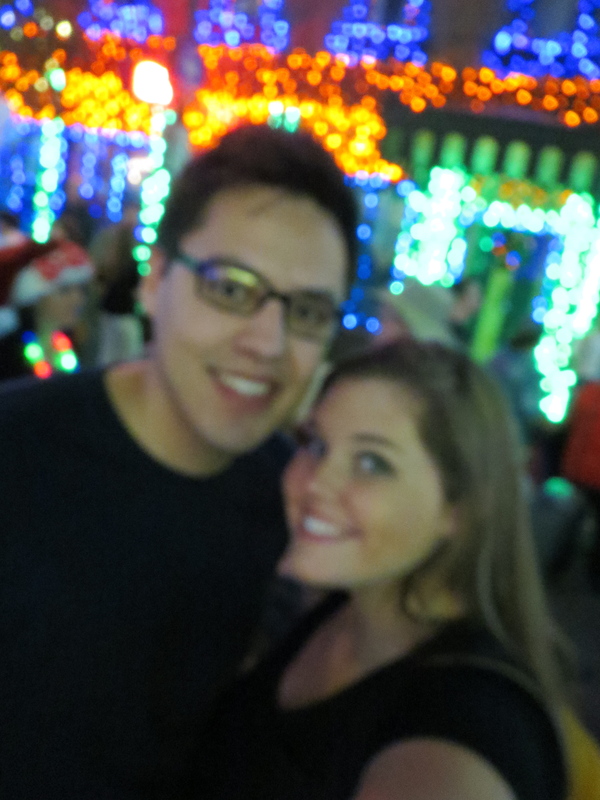 We had a great time enjoying the lights, but it was PACKED, so we didn’t linger over there too long. 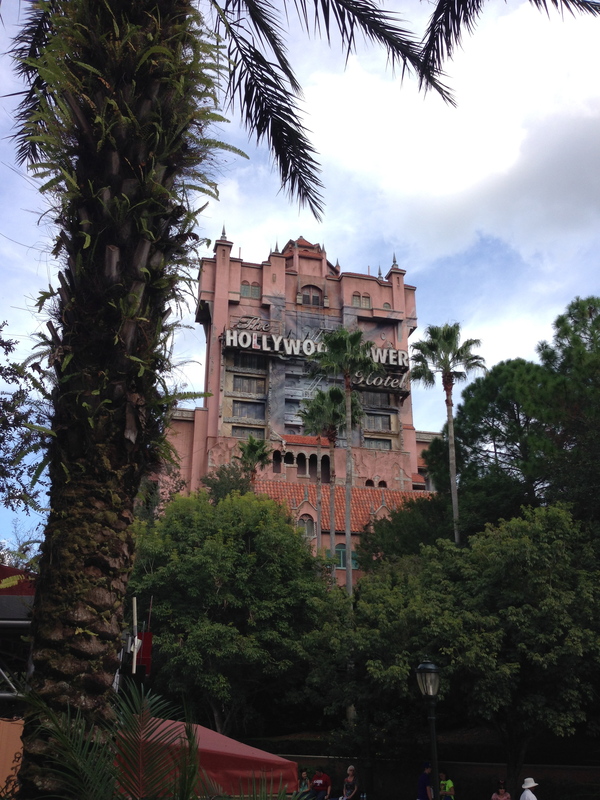 The rest of our time at Hollywood Studios included more of our favorite rides before we closed down the park. The bus lines were crazy again, so we hopped on another Art of Animation bus. While there we grabbed a snack in their amazing food court to enjoy on our way back to the hotel. I got a chocolate chip cookie and 1 liter of bottled water (even in December the Florida sun can drain you! 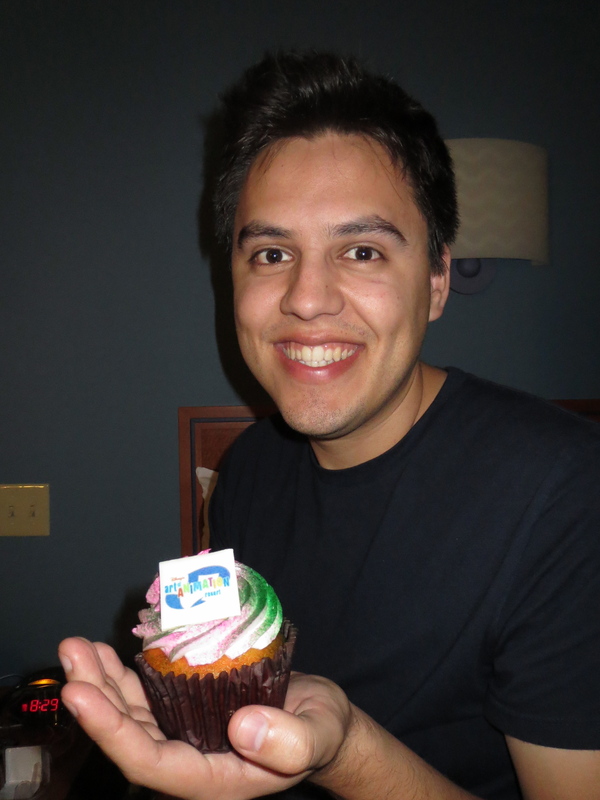 ), and Louis got a beautiful vanilla cupcake! 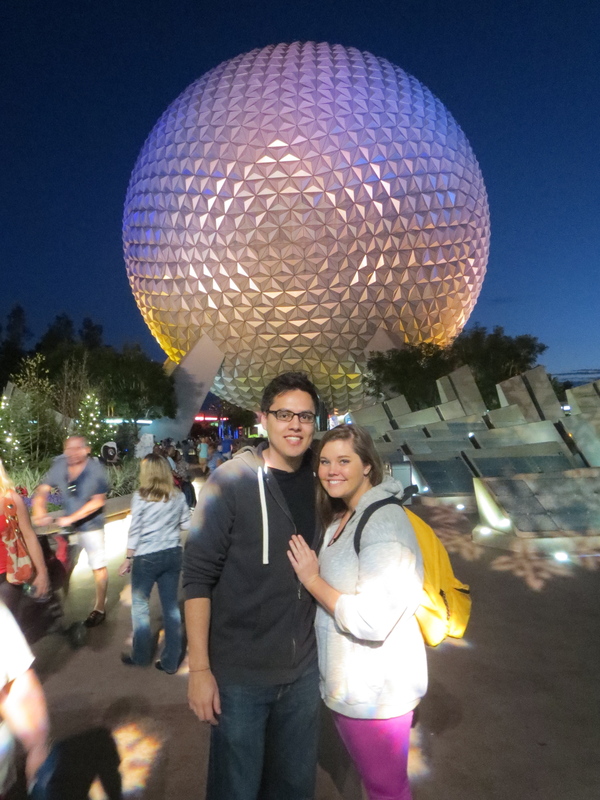 A couple of weeks ago, Louis and I enjoyed our 4th trip together to Walt Disney World in Florida. 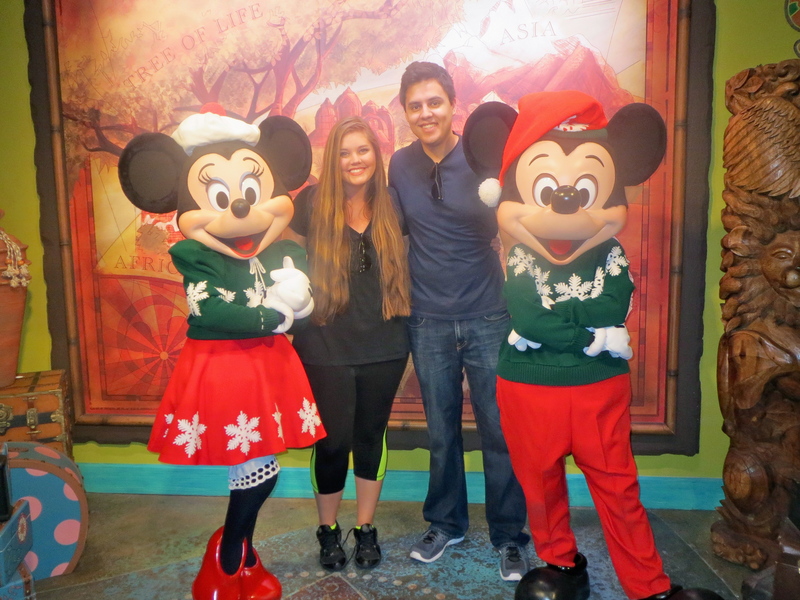 As always, it was so fun and magical, and we enjoyed it during Christmas, which is always extra special. 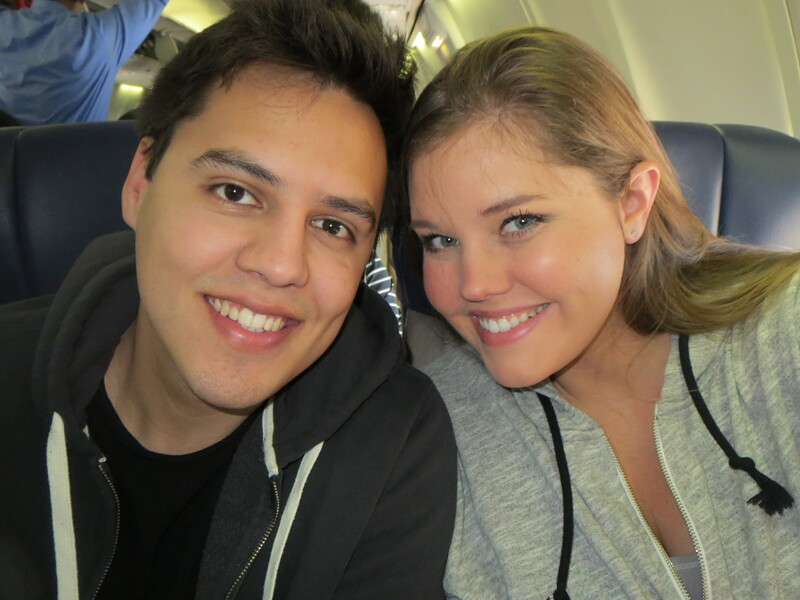 We flew out of Bergstrom Airport in Austin on December 3rd, which frustrated me because it was my first time to fly out of that airport, and I was no longer a Bergstrom! 😉 We ate Salt Lick BBQ while we waited for our flight, and I started rereading Mockingjay, while Louis began a recently purchased Ender’s Game. We also tried the Toy Story antibacterial hand sanitizer I purchased just for our trip, and unfortunately realized it smelled like garbage (literally, like a dumpster). Shame on you, Walgreens $1 shelf. 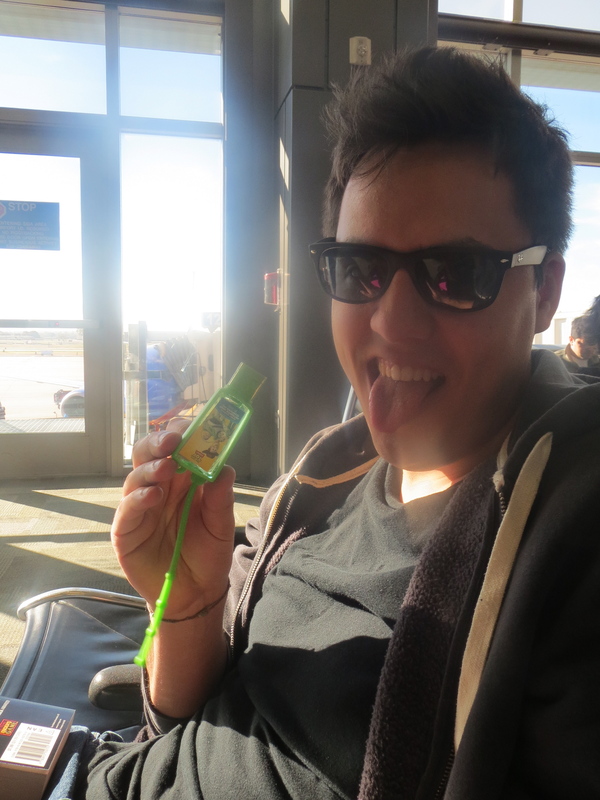 A little after we tossed the hand sanitizer, we boarded our plane to head to Orlando! A few hours later we touched down in sunny, HOT Florida! We slipped on our Magic Bands that we had been selected to test and checked in to board our Magic Express to our hotel. 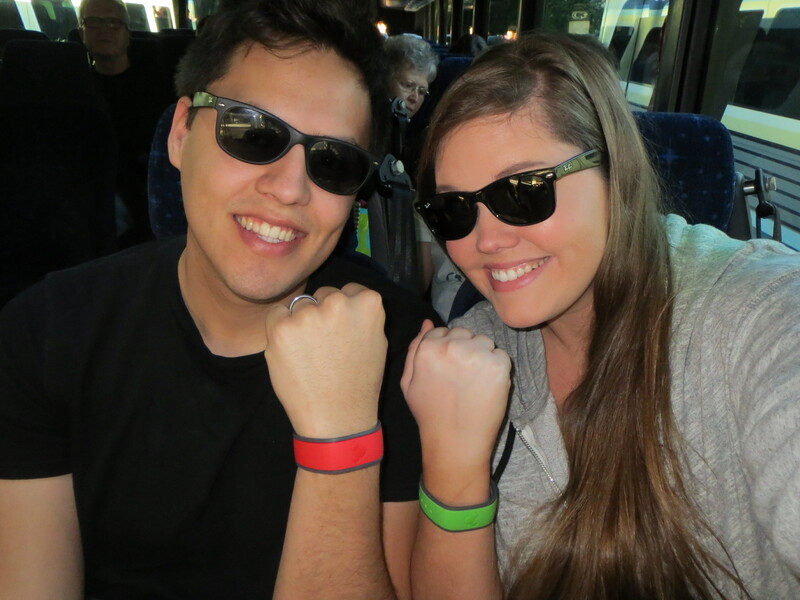 (So much magic already…) We picked red and green Magic Bands to celebrate our Christmas trip! 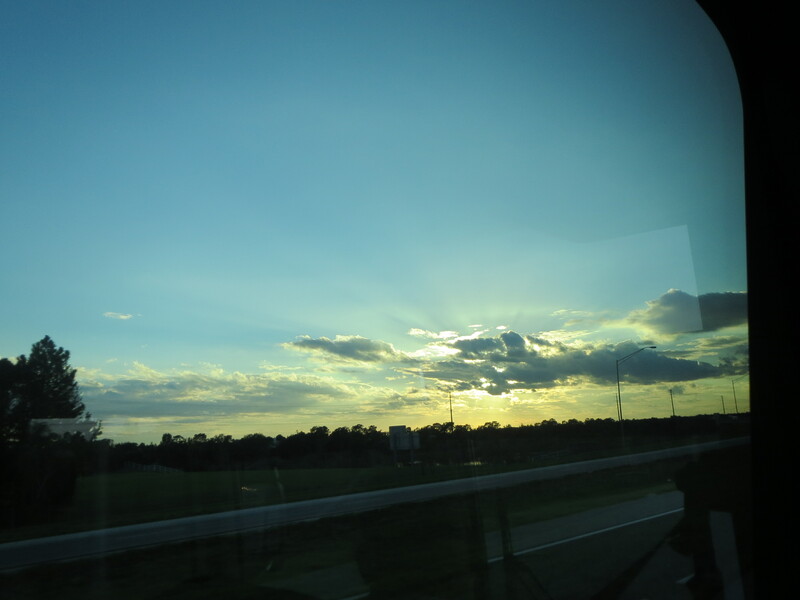 We were greeted by a beautiful Florida sunset on our trip to our resort! 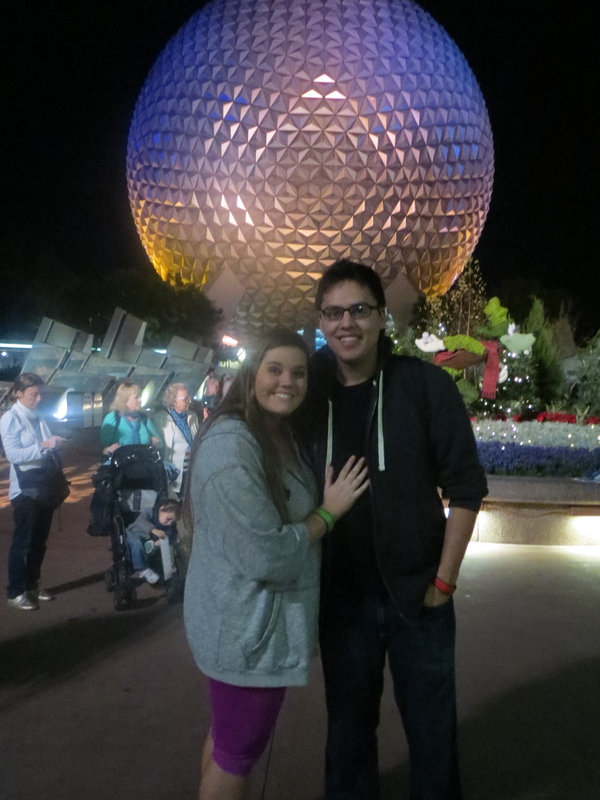 We checked in at Pop Century and quickly headed to Epcot. 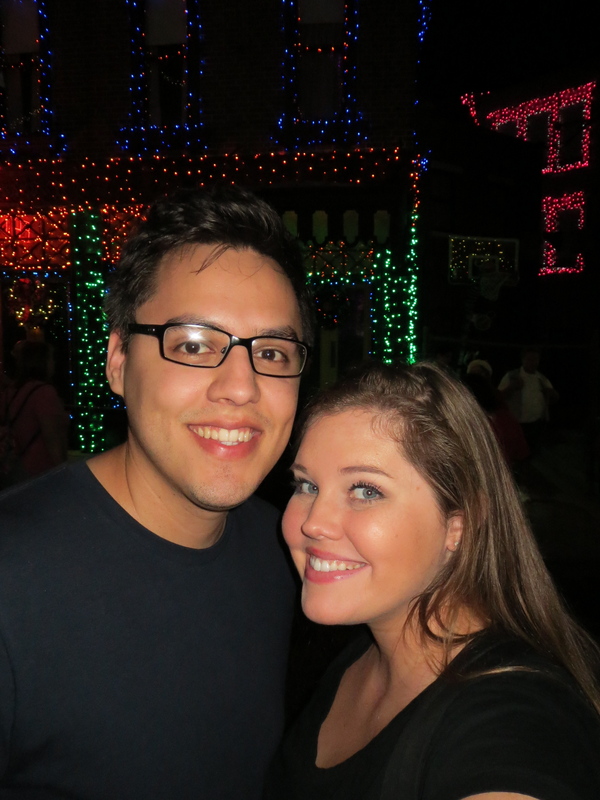 It was going to be open late, and we wanted to catch their amazing Christmas fireworks show: Holiday Illuminations. 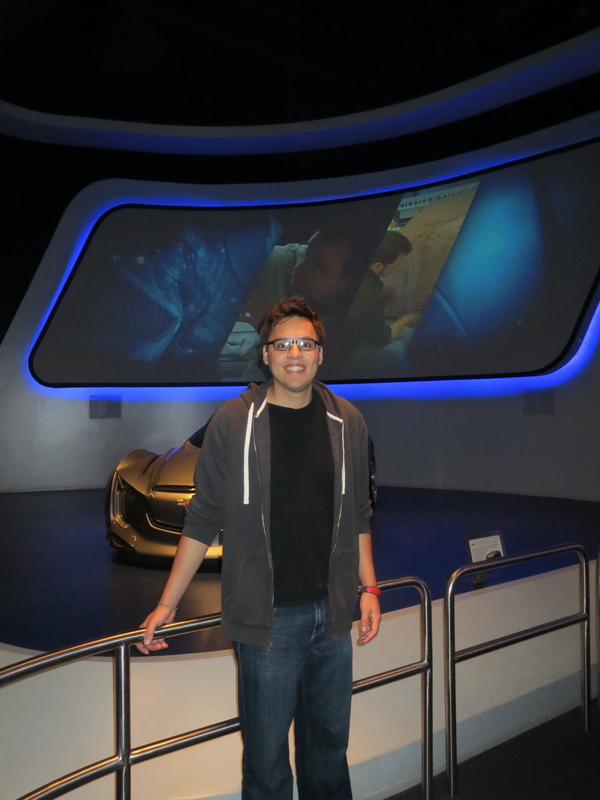 Our first stop (after the obligatory entrance shot), was the newly redesigned Test Track. 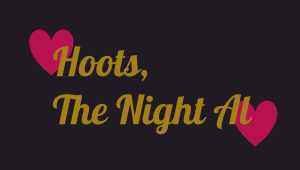 Well…new to us! I think it’s been remodeled for over a year now, but we were excited to try it out! The track is basically identical, but all of the inside elements were changed. 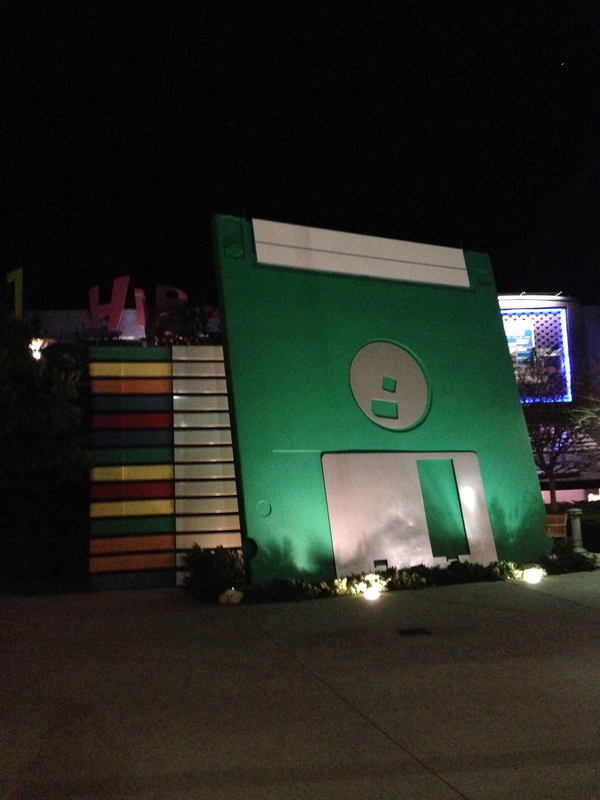 It was a lot more modern, and lots of the special effects were really cool! 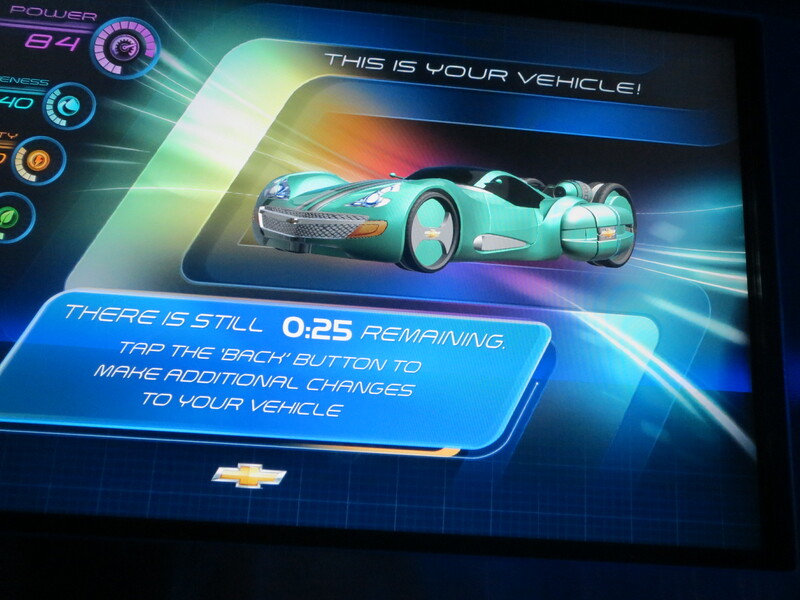 Our favorite part of the remodel was the ability to design your own vehicle to be tested through each of the trials during the ride. You get to pick everything from the design to the engine to the tires to the color! Louis obviously let me pick the color :). After Test Track, we realized it had been quite awhile since we ate lunch, so we headed to Mexico in the World Showcase to enjoy some “authentic” Mexican food. 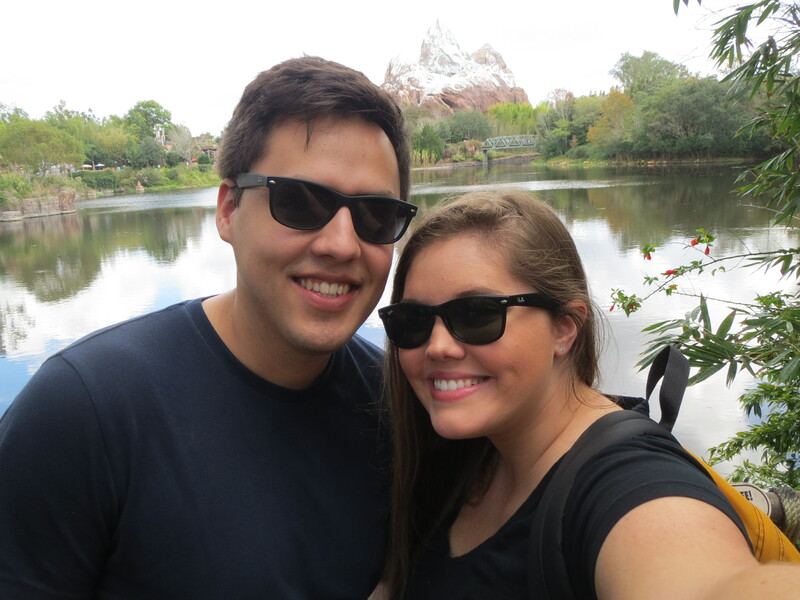 We ate at La Cantina de San Angel, which was PACKED, but we were able to snag a table right by the World Showcase Lagoon. I enjoyed some yummy nachos, and Louis chowed down on some beef tacos. 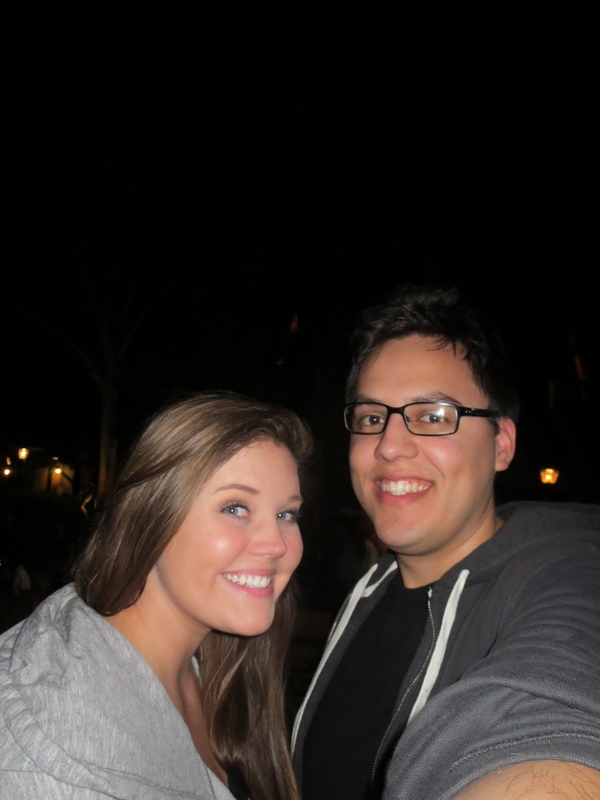 After dinner we rode Maelstrom in Norway and decided to stake out a spot for Illuminations. 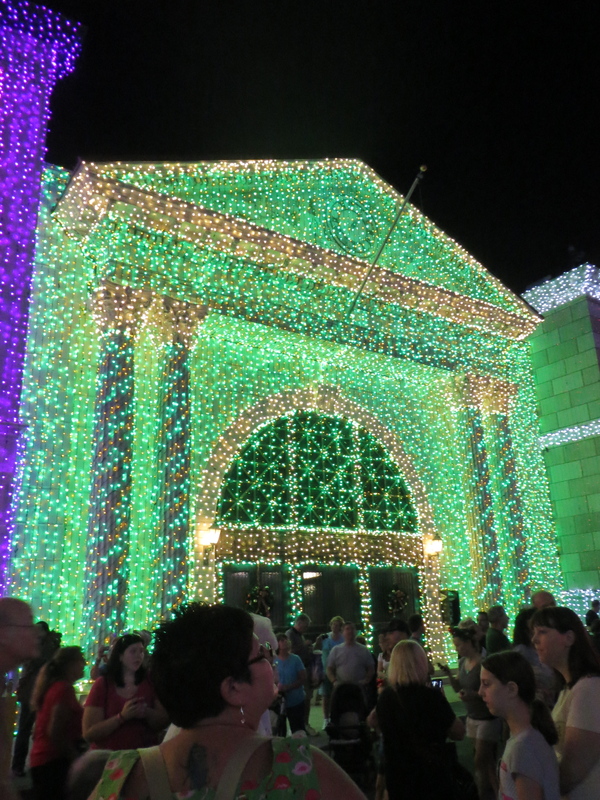 During Christmastime, this is probably our favorite nighttime show at the parks. After the regular Illuminations show there is an incredible fireworks finale set to “Let There Be Peace On Earth” that drops our jaws every time. 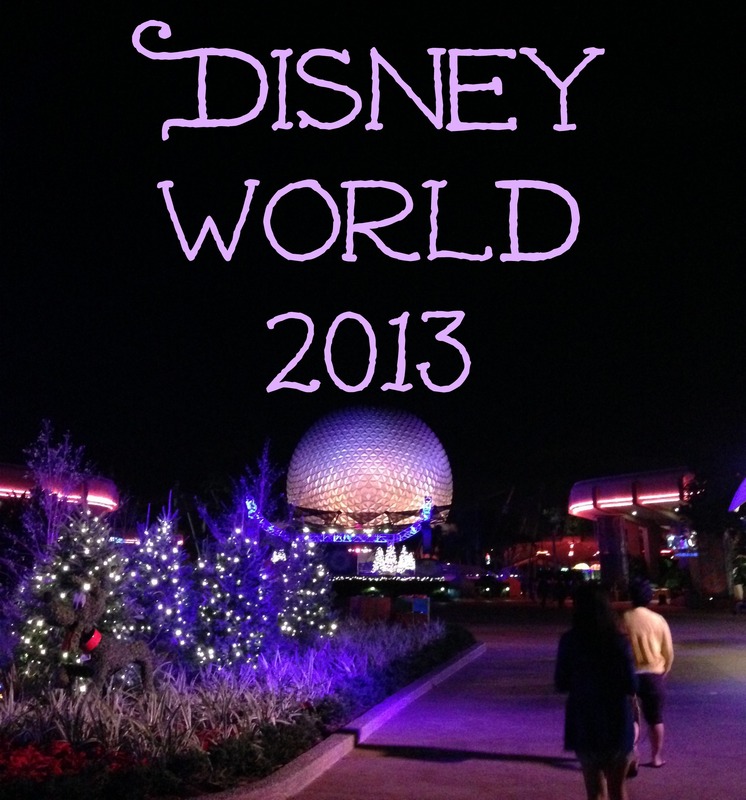 We love it so much we made a point to see it twice on our trip, so I’ll try to add a video in my next post about Epcot! After Illuminations the park was clearing out, so we took a little bit of time to explore some of the empty showcase pavilions. 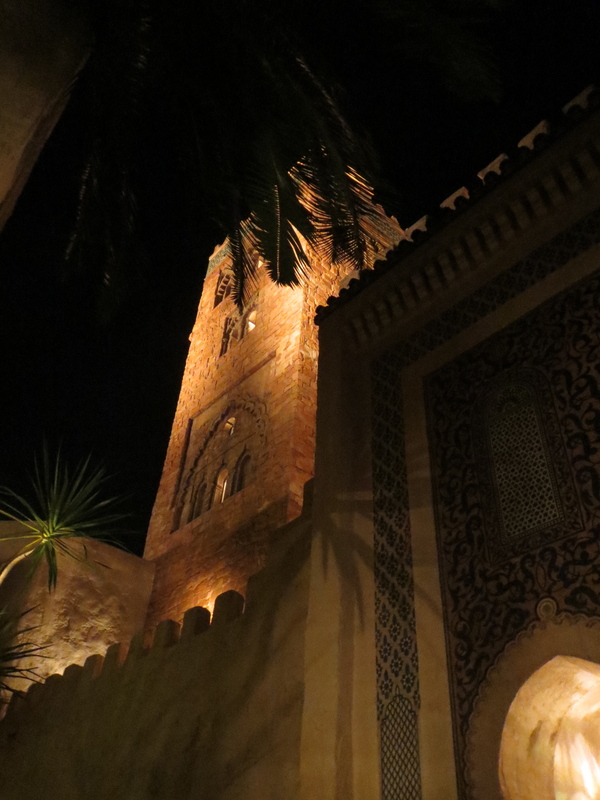 We strolled around Morocco for a long time, and realized we have never noticed the beautiful architecture and details. Each of the countries represented in the showcase are fully or partially designed and funded by their respective country. 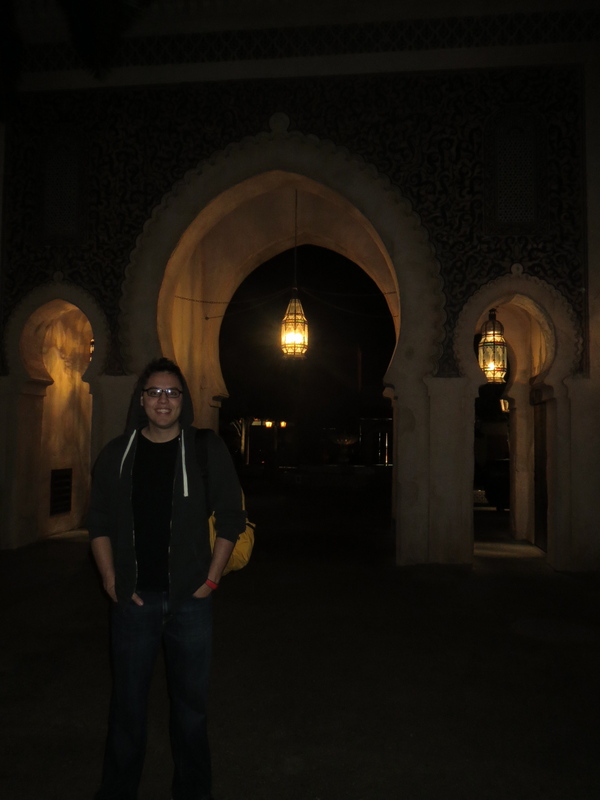 Apparently, the KING of Morocco personally selected items and details to be part of the Morocco pavilion in Epcot! I’m not sure if that means there just isn’t much going on over there or if he’s super into Disney, but either way, their pavilion is beautiful! 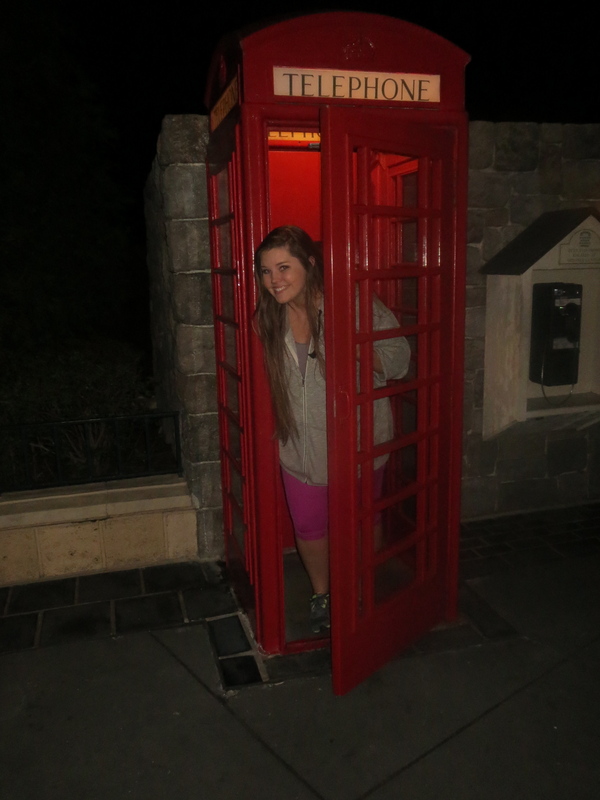 We made a quick stop in Canada for some obligatory phone booth pictures as well. 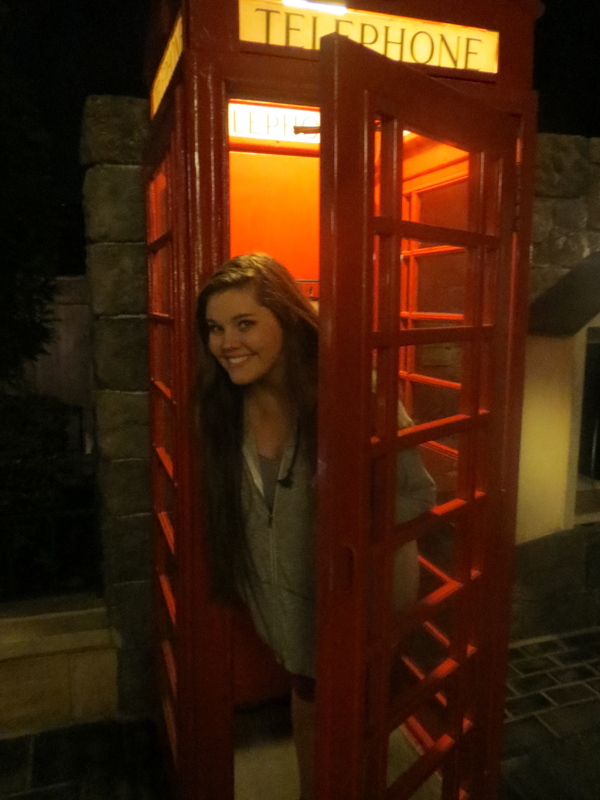 Apparently, you can actually call the phones in these booths, so if you’re ever lonely or want to check the weather at Epcot give them a ring. 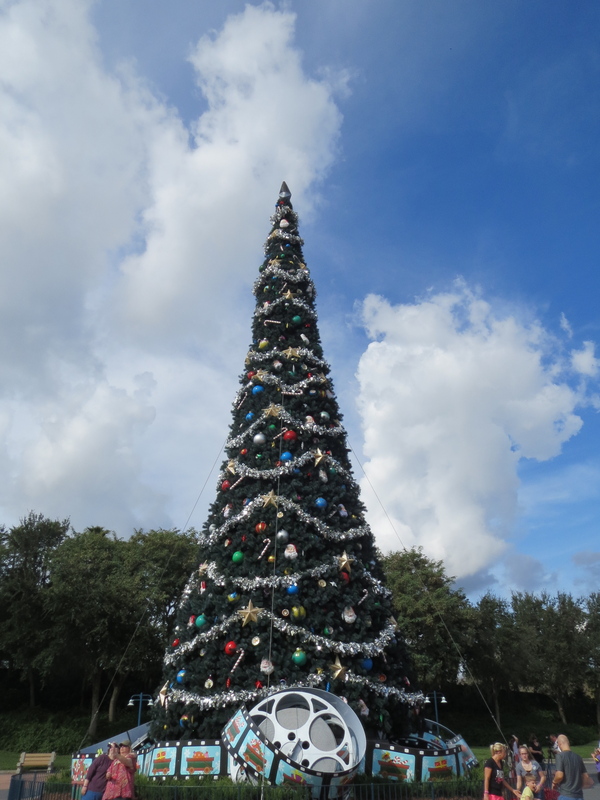 Each of the 4 parks has its own 65-foot Christmas tree full of lights and ornaments. 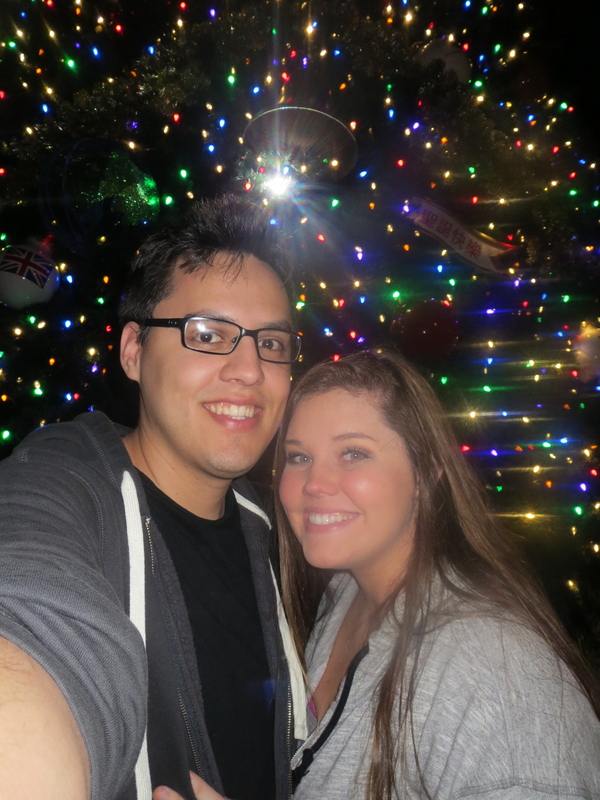 Epcot’s tree had ornaments representing all of the countries and twinkly multi-colored lights! 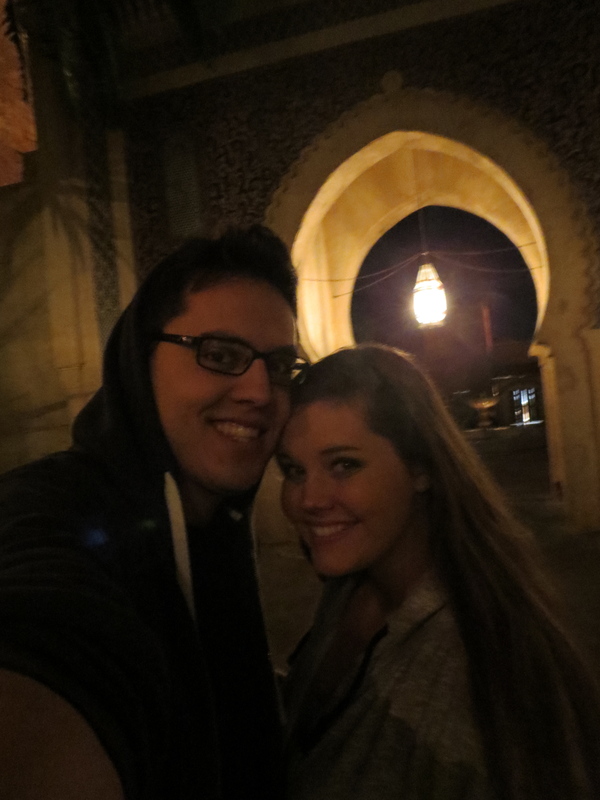 We were pretty pooped at this point from our long day of traveling, so we hopped on the bus back to our resort…sort of. 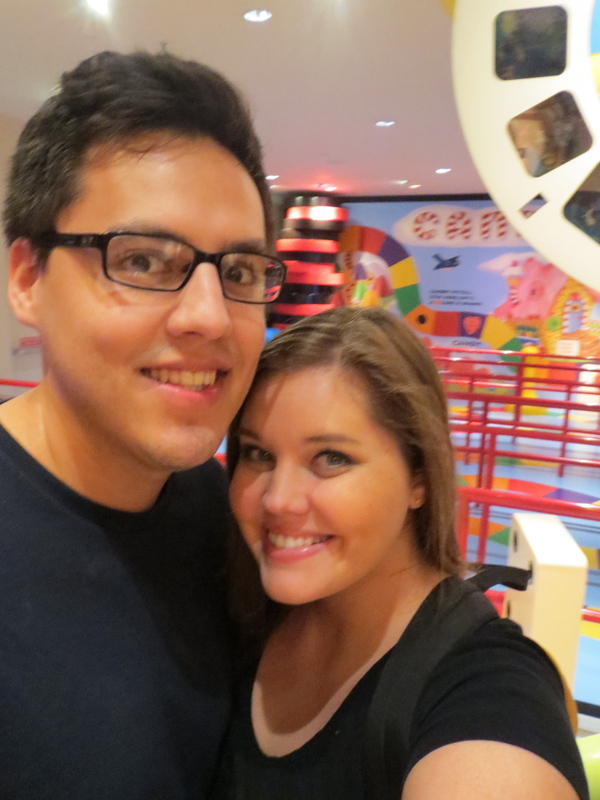 Pop Century’s bus line was crazy long, so we took a bus to the adjoining Art of Animation Resort and simply walked from there back to our room. 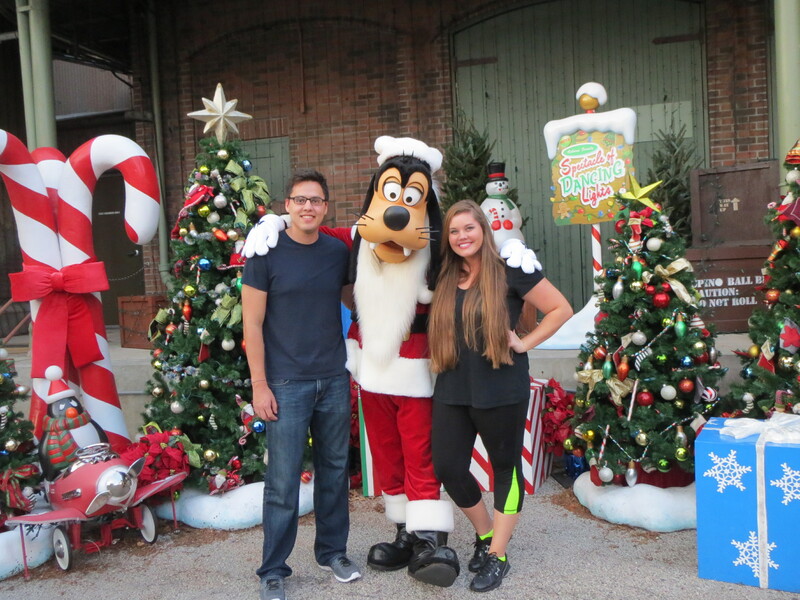 Aren’t we such savvy Disney travelers? 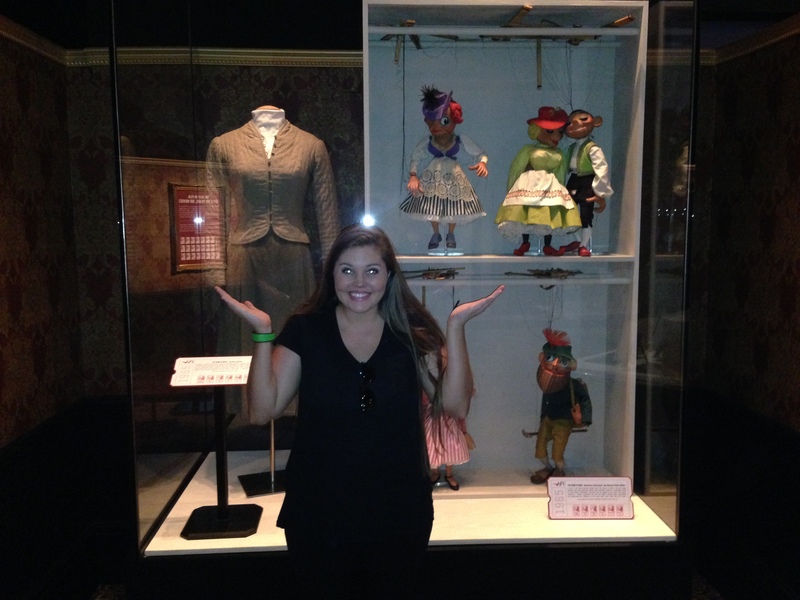 😉 The Art of Animation is a brand new value-level Disney resort, and it’s really fun! 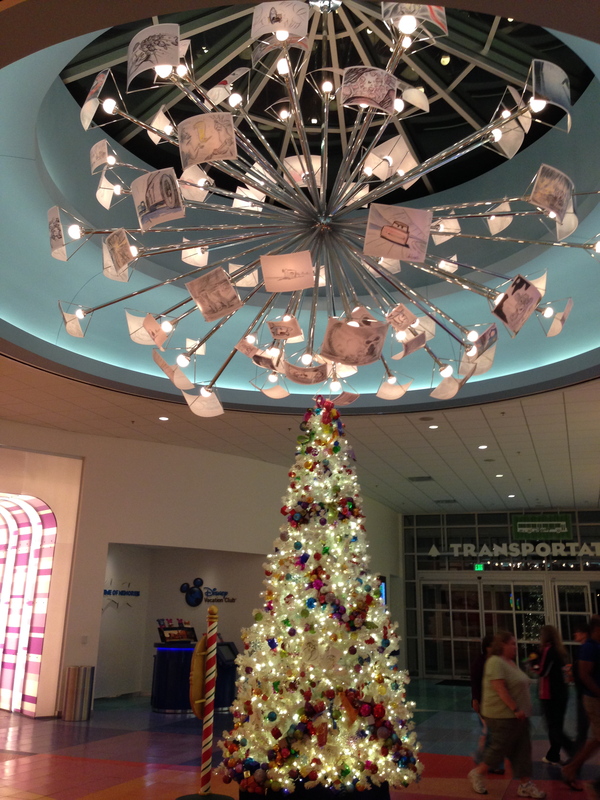 We loved the details and enjoyed exploring the resort as we strolled over to Pop Century.